Pumped by his popularity, the Whyalla uneARTh festival mascot has grown into a big, big boy! Check this out ... a 2m high ARTie! Whoa, this is one big puppy and he's raring to get off the leash and continue promoting the 2018 Whyalla uneARTh Festival happening on March 30-31 at the Ada Ryan Gardens. 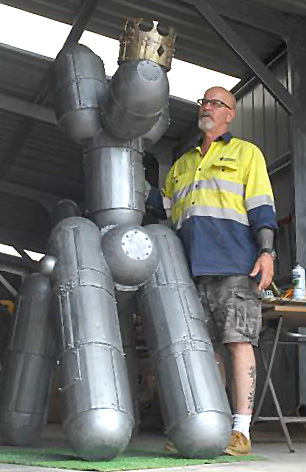 We've seen ARTie on our TV screens, we've seen him being coloured in by tons of kids around town, we've seen him being made with balloons at the library and at shopping centres ... now he's emerged from Pete Santucci magic grotto as a massive piece of magnificent, metal dog. "What a star ARTie has become for the Whyalla uneARTh Festival," City of Whyalla Tourism and Events Officer and festival organiser Rebecca Neilson said. "He's almost stealing the show ... lucky we've got a bucketload of acts, activities, arts and markets at the festival to back up this big boy's presence. "Only a genius like Pete Santucci could make ARTie this big and bold ... well done to Pete, our Council whiz at all things creative and construction-like." The "big" ARTie will make his public debut on Wednesday (March 28) at the Westland Shopping Centre. He'll be in the centre of the shopping centre from 12.30pm to 2.30pm where he'll also have a stack of free uneARTh Festival programs to hand out for the FREE admission festival on March 30-31. ARTie was named after a competition calling for suggestions. Rebecca Gow's suggestion of ARTie really resonated with the judges. It built in the “ART” of the uneARTh Festival and is a short, sharp and sweet name that really encapsulates what the festival is all about … arty and exciting. Come on down to Westland Shopping Centre tomorrow to check out this big woofer.